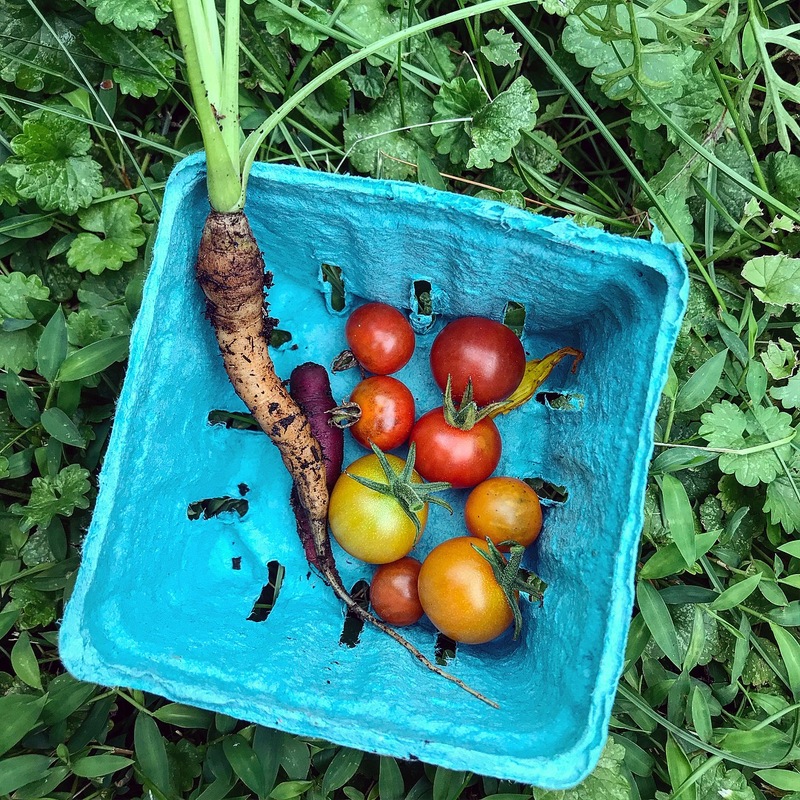 I say this every year, but: I can’t get enough summer produce. Warm tomatoes right off the vine, crisp green beans with a satisfying snap, juicy peaches and nectarines and berries… whether it comes from my local farmers market or my own backyard, summer produce is a treat to be savored. Our farmers market is tiny. But among the three produce vendors, the two bakery stalls (including one with vegan cookies! ), the brewer, the vintner, and the coffee roaster, it gets the job done. (We won’t mention the butcher’s stall. I try not to look at it.) The first two summers after we moved into our house, I had a sweet Saturday morning routine of getting up and walking to the market. It’s less than a mile away, so even during the hottest and most humid of summer days, it was manageable. Sometimes I’d treat myself to a cookie and an iced coffee (back when Brewing Good exhibited at the market). This summer, the routine has changed a bit — I visit a hospice patient every Saturday morning, so I just stop by the market on my drive home — but the joy I get in wandering the stalls and watching the offerings change with the season hasn’t diminished. Nor, of course, has my sheer pleasure in devouring fresh produce. It’s been a hot, hot summer, so Steven and I have enjoyed a fair few stove- and oven-free meals. Simple salads were a staple side dish earlier in the season, but now that lettuce isn’t as readily available from our market vendors, we’ve switched to some lettuce-free summer salads that still make use of all that juicy produce. Here are a few we’ve enjoyed. Bread in salad: A genius pairing, or the most genius pairing? Plenty of cultures have their own take on transforming stale bread into soup or salad, and I’m here for it! I’ve been making my own bread since I got a sourdough starter from a friend in the spring, and occasionally my loaves get a bit dry before we have time to finish them. (Clearly we’re doing something wrong.) Enter panzanella! We’ve enjoyed a few spins on the dish, but my favorite actually didn’t include regular bread at all. 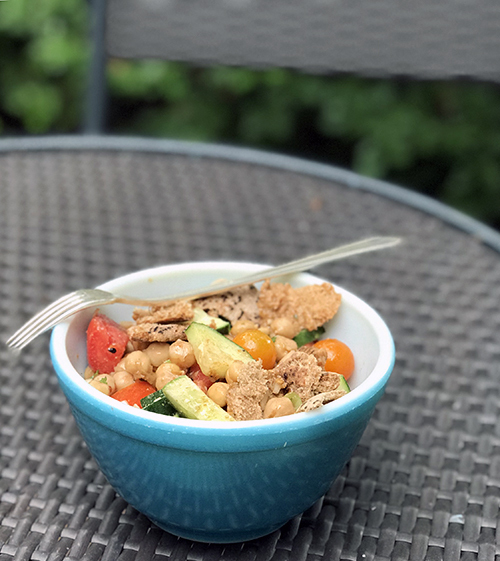 Hannah describes the Falafel Fattoush as an “herbaceous Middle Eastern panzanella,” but whatever you call it, it’s delightful. Featuring toasted pita shreds, cherry tomatoes, cucumbers, chickpeas, and herbs along with lemon juice and lots of spices, the dish is an unquestionable winner. It’s surprisingly filling, too — I had to finish Steven’s portion! This Fattoush Lebanese Salad from Kalyn’s Kitchen looks like a decent alternative to Hannah’s recipe, although this one does require lettuce. I looove the idea of including fancy olives in a panzanella, so this recipe looks delightful! Sweet summer corn and juicy summer peaches are two of my favorite farmers market finds, but I have yet to eat them together. Enter this recipe, which makes that combination possible! Do you ever buy a cucumber (or pick one from your garden) and then think, What is even the point of cucumbers, besides putting them in dainty teatime sandwiches? Yes, me too. You can’t really cook with them, so they must be eaten raw. (My old roommate and I once tried braising a cucumber. I do not recommend it.) Yet all too frequently I find myself with a slowly softening cucumber in the produce drawer, its increasingly pockmarked skin an indictment of my rash purchase. WELL. Imagine my delight when this article from Food52 showed up in my feed, touting the deliciousness of a simple cucumber salad with a “magic spice blend.” And imagine my further delight when I read that the magic spice blend is “not unlike cucumbers with Tajín” and recalled that, just a few months prior, a coworker had returned from a trip to Mexico with small bottles of Tajín and handed them out to us, and that I — sadly ignorant of the magic that is Tajín (and also unable to open the plastic cap) — had stowed the bottle in my spice drawer for future use. So, inspired by the article (and newly able to open the Tajín), I made a super-simple cucumber salad that was, quite literally, just sliced cucumbers and Tajín. If you, too, have spent your life devoid of the magic that is Tajín, let me enlighten you. Per the Tajín website, it is a “unique seasoning made with … mild chili peppers, lime, and sea salt.” (You can find a DIY recipe here.) I’m in love with it. It’s the perfect addition to pretty much any vegetable, from simple sliced cucumbers to sweet roasted corn on the cob. But I digress. My point is to say that chopped veggies + Tajín have become my new favorite leaf-free summer salad. Inspired by this kachumber recipe from Vegan Richa, I used all the veggies plus Tajín and had myself an absolutely delicious spicy summer salad. I cannot recommend this combination highly enough! If you want to incorporate more raw veggies in your summer suppers, adding Tajín is the way to go. So… what are your favorite lettuce-free summer salads? Note: This post contains affiliate links, which help me keep the lights on.